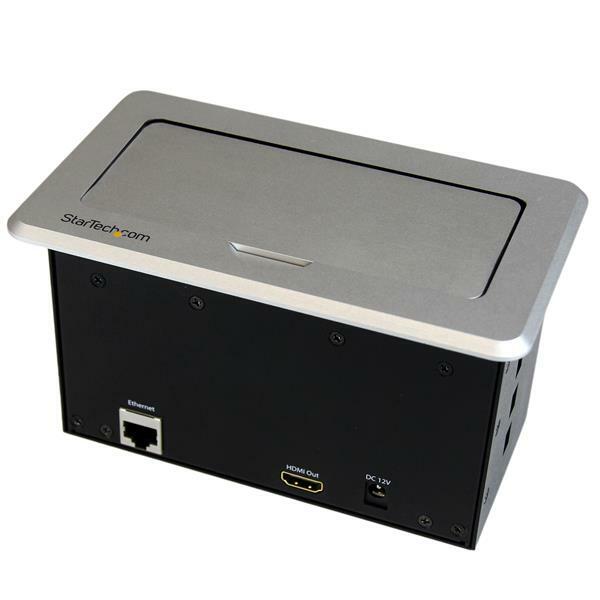 This connectivity box for conference tables features a concealed, in-table design that lets you connect a VGA, Mini DisplayPort, HDMI or composite video source device to an HDMI display or projector. 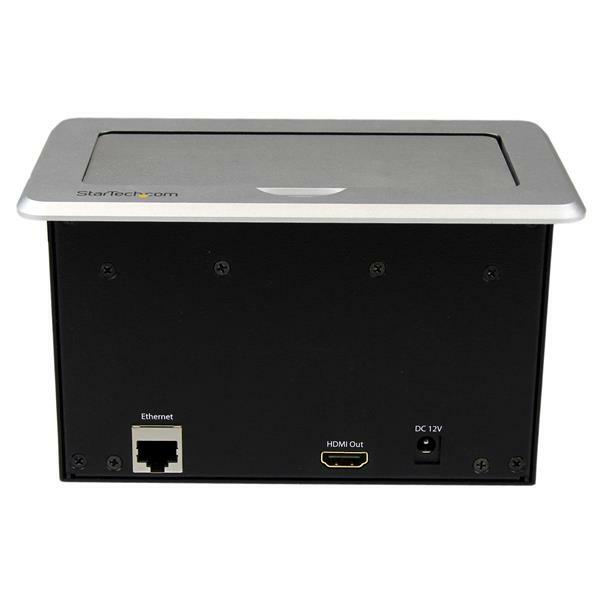 When the video switch isn't in use, you can simply slide the stylish cover panel over the connectors, hiding them inside the table or podium surface. 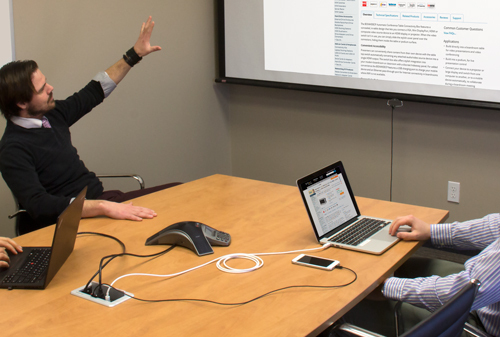 Presenters can conveniently share content from their own device with the table top switch automatically converting any attached audio/video source device into a single HDMI output. The switch box also offers stylish integration into your modern boardroom or classroom with a discreet hideaway panel. 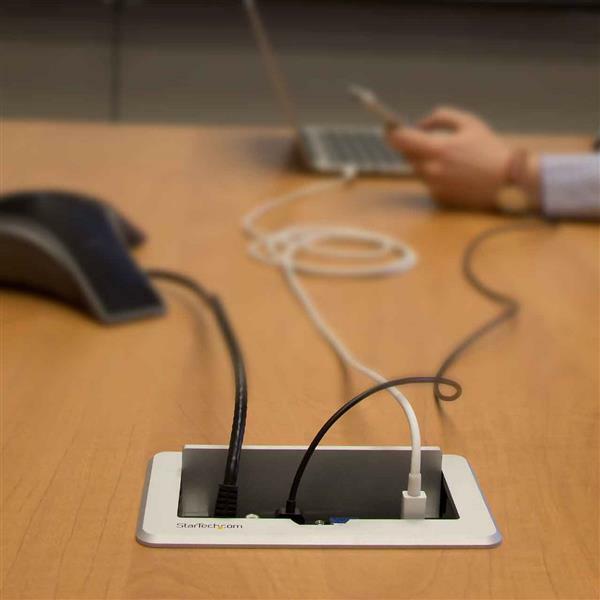 For added convenience the BOX4HDECP features a USB charging port to charge your mobile device and an Ethernet pass-through port for Internet connectivity in boardrooms where Wi-Fi® is not available. 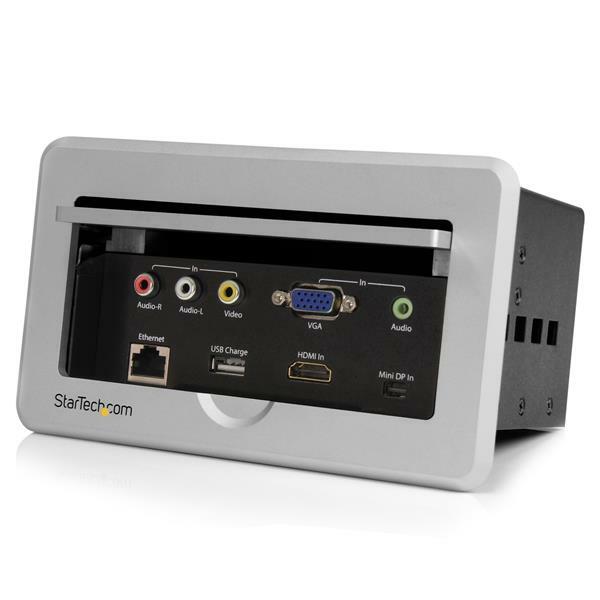 The A/V switch makes your large display accessible to any presenter's video source device, by installing directly into the surface of your table or podium, and automatically outputs the most recently connected video source. Plus, support for high-definition video resolutions up to 1920x1080 (1080p) ensures that the quality of your presentation is maintained. 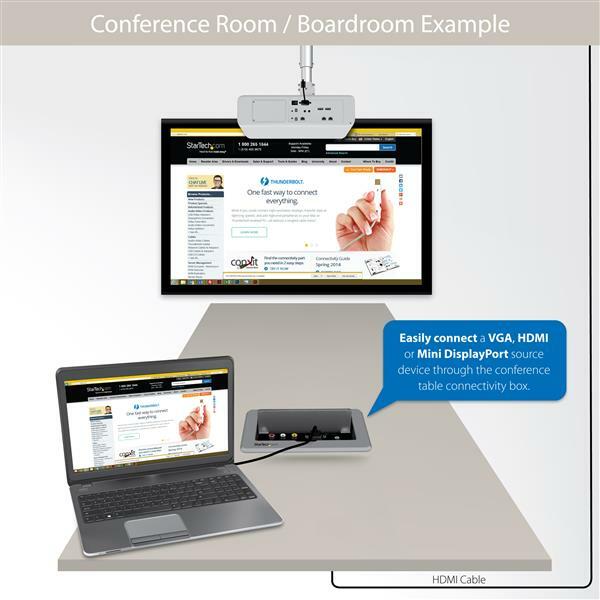 With support for different video inputs, including HDMI, VGA, Mini DisplayPort, and composite, the video switch ensures support for almost any laptop, Ultrabook™ or mobile device such as MacBook®, Microsoft® Surface™ Pro 2 & 3, and Lenovo X1™. 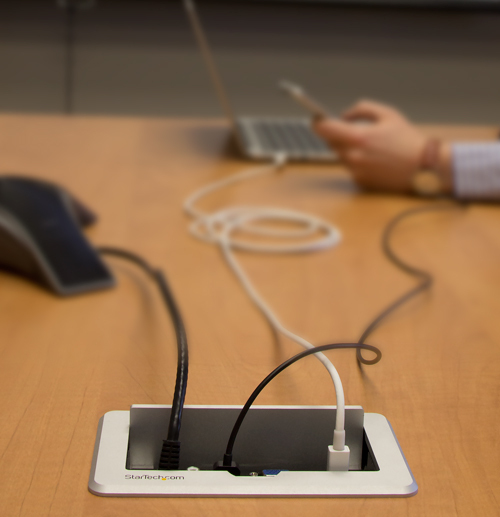 The switch panel even works with legacy audio/video devices such as DVD players, and supports the use of video adapters for your iPhone® or iPad®. 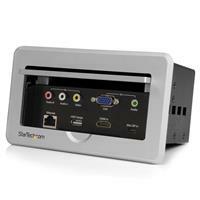 The BOX4HDECP is backed by a StarTech.com 2-year warranty, and free lifetime technical support. Can I convert from HDMI to DVI when using the BOX4HDECP? 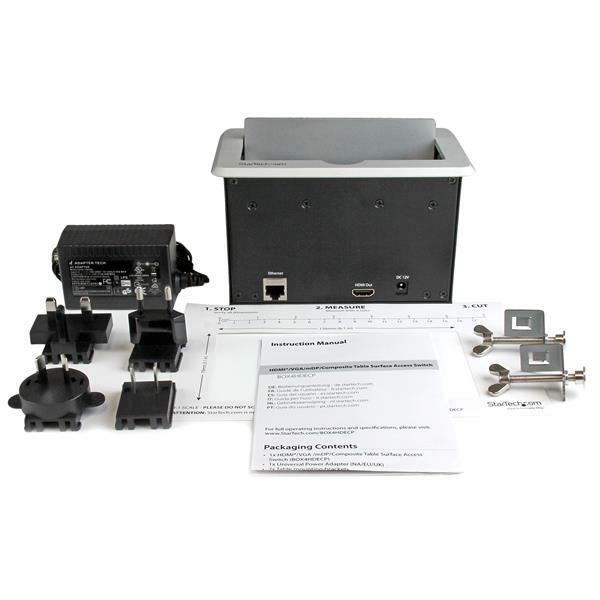 There are known incompatibilities when converting the HDMI port on the BOX4HDECP to connect a DVI display or projector. It is recommended to use HDMI to HDMI cables with the connectivity box whenever possible. My display or projector is not detected by my computer when connected to the VGA port, what should I do? To detect the additional display or projector as a secondary display (Mirror, Extend or Projector only), use the hotkey command Windows + P.
This forces the computer to look for external displays and pass the necessary EDID (Extended Display Identification Data) information. We bought a couple of these for a major project without pre-testing. We were not disappointed and we have a very happy customer.first and smooth switching for the digital inputs. We shall continue to specify these. Why only 4 stars then?